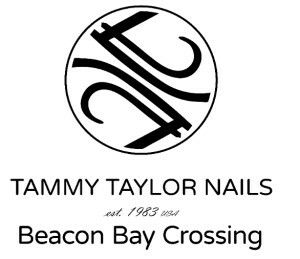 My Appointment | Tammy Taylor Beacon Bay Crossing | Book appointments online hassle free. "I opened my first salon in 1981, when I was 18 years old, with only a $400 budget. It was only 385 square feet, but… within two years, it expanded into a larger, full-service salon, including my own professional nail product line, began offering seminars, workshops, teaching nail technicians, salon owners, beauty school instructors and students on skills and how to build their own business." ​In 1986, I won the World’s Record for the fastest set of Pink & White Sculptured Nails, in less than 20 minutes, and in front of a live audience. I still continue to hold this title. ​In 1990, I wrote “The Complete Guide to Manicuring and Advanced Nail Technology”. It is still used in the nail industry by professionals and beauty schools to prepare students to pass their State Board Examinations. No more smelly monomer - 4x different liquids to suit your clients need (see catalogue) especially for those "chronic lifters"
"Spray the pain away" - Topical pain reliever for those sensitive cuticles - works like magic!